This chocolate cake is a feast for the eyes and soul. It is easily the most delicious cake I’ve ever made. I don’t profess to be a baker- the recipe came nearly perfected from Smitten Kitchen, where I saw this cake posted but never intended to make it. But then I was at home with my mom while she was recovering from surgery, and about 3 hours after she was home from the hospital, she requested chocolate cake. A sure sign of health! I sped to the kitchen and pulled up this recipe, recency effect in full force, and the chocolate cake helped us all feel better. It is rich in chocolatey flavor, slightly crisp around the tops and edges, with a crumb/fudge hybrid in the center. A slice (and sometimes two) of this cake welcomed all of my mom’s visitors, each of who asked if the cake was flourless. It’s not. The cake eventually dwindled down to its final slices, and the time approached for me to return to DC. But before I could leave, my mom kindly requested a replacement cake, and I was happy to oblige. I have now made this cake three times, each with success. I learned a few things along the way, namely that you should make this cake immediately. To do so, get a 9 inch cake pan, and grease it by rubbing a stick of butter around its bottom and sides. Cut out a round of parchment paper, and stick it on the bottom of the pan to ensure that the cake will come out easily. Then, get a decent sized pot (a 3 quart pot is best, but a 2 quart pot will do). In the pot, melt 9 tablespoons of butter (1 stick plus 1 tablespoon). 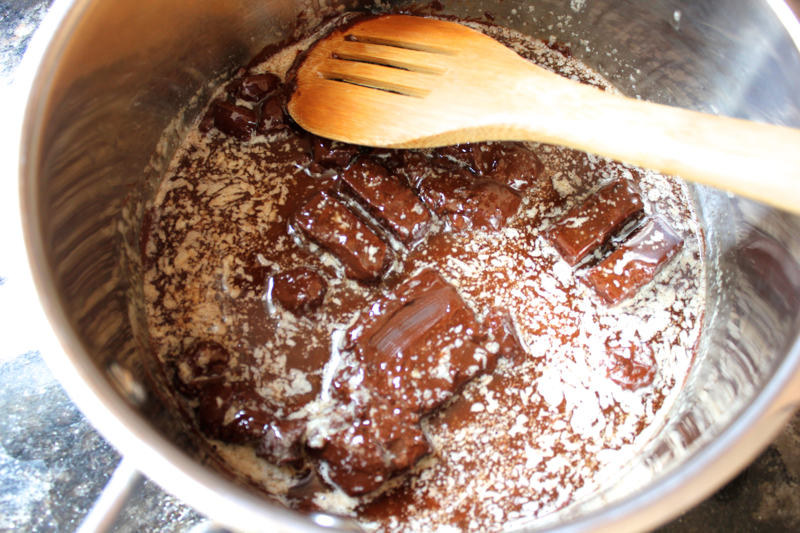 Once the butter has melted, remove the pot from the heat, and stir in 7 ounces of dark chocolate until it melts and is smooth. Stir 2 tablespoons of water into the chocolate mixture until it is smooth once again. Then, stir in 3/4 teaspoon of baking powder, 1/3 cup of flour, and 1/3 cup of cocoa powder. Preheat your oven to 350º F.
Get out one medium-sized bowl and one large bowl. Separate 4 eggs, dropping the whites into the large bowl and the yolks into the medium bowl. To the yolks, add 1 cup of sugar, 1 tablespoon of water, and 1/2 teaspoon of vanilla extract. Use a whisk to combine the yolk mixture until it has gone pale in color and looks smooth. 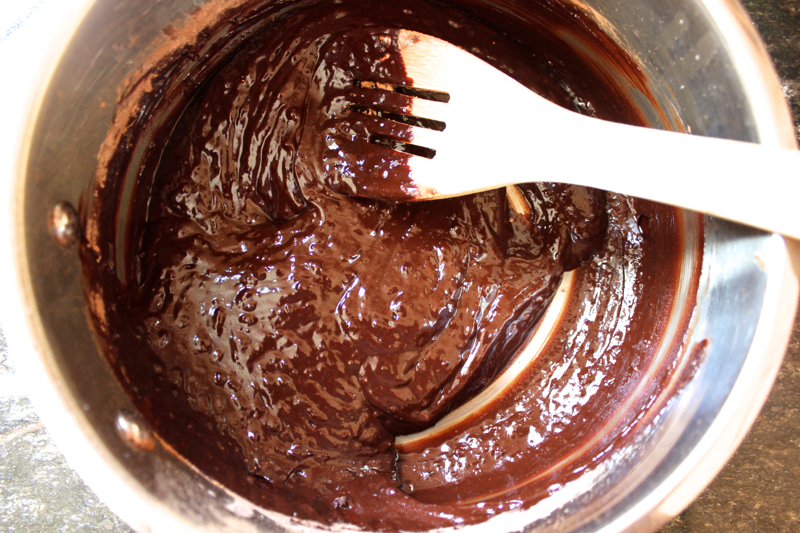 Stir the yolk mixture into the pot of chocolate until it is fully incorporated. To the large bowl of egg whites, add 2 pinches of sea salt. 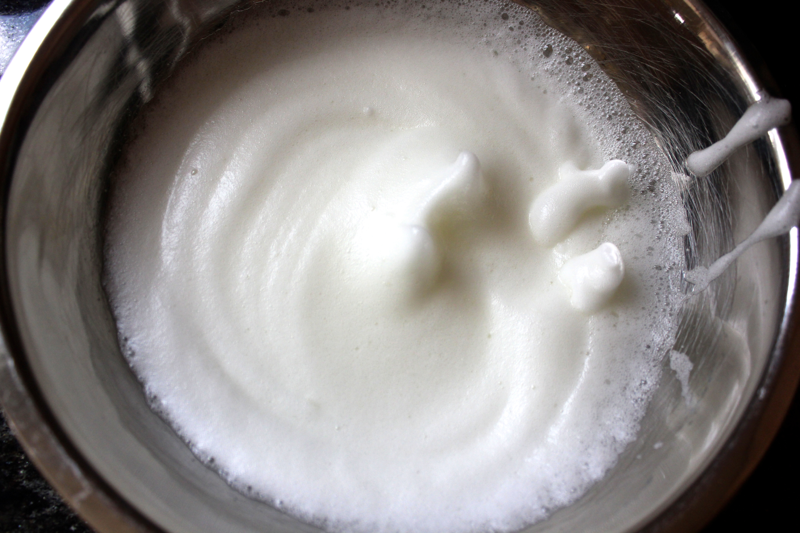 Beat the egg whites until they hold stiff peaks, ideally using an electric mixer. 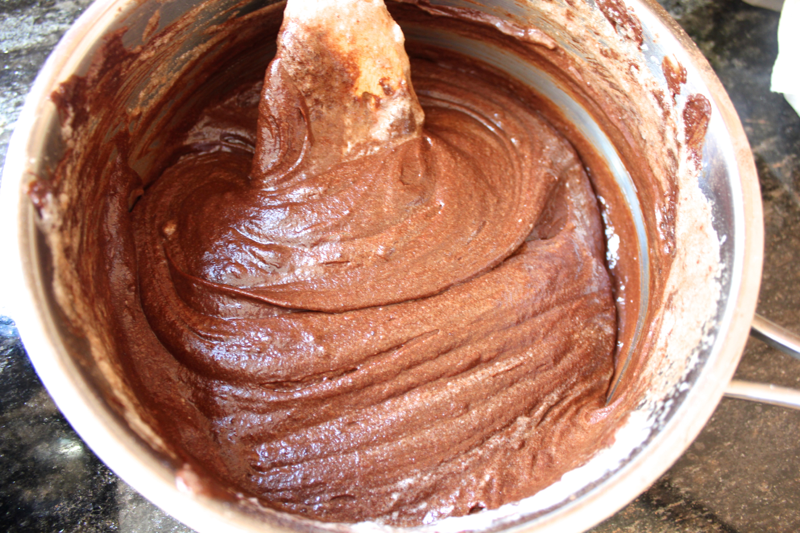 Add 1/3 of the beaten egg whites to the pot of chocolate, and stir it around to lighten up the chocolate mixture. Once the egg whites are combined, add in the rest of the egg whites, and gently fold them in until they are combined. 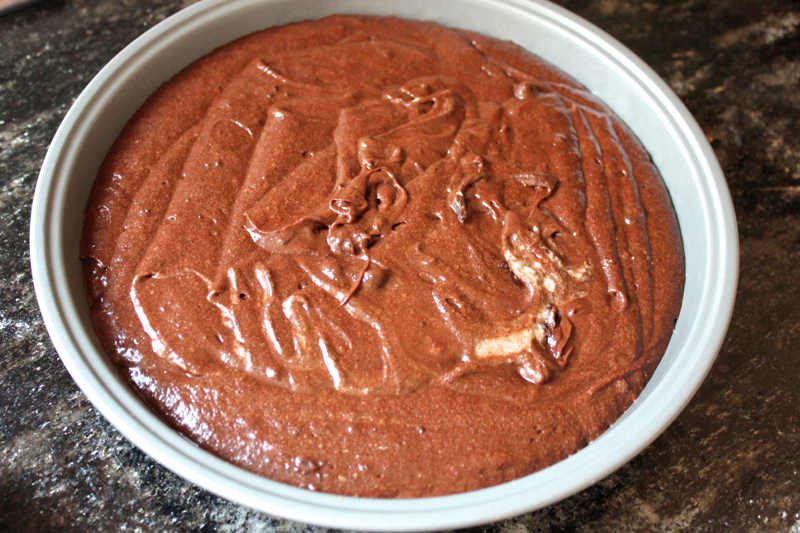 Pour the chocolate mixture into the prepared cake pan, and bake the cake for 35-40 minutes until you can insert a toothpick into the center of the cake and remove it relatively cleanly. Remove the cake from the oven, and let it cool for at least 5 minutes before removing it from the pan, running a knife around the sides of the pan first to make sure the cake is loose. The first two cakes that I baked at my mom’s house puffed up, formed a domed crust, and then deflated as they cooled. The domed crust remained and eventually cracked when I removed the cake from the pan. It was no problem at all, I just plated the cake upside-down. It looked fantastic, and we still were able to enjoy the crispy top. When I made the cake in my own kitchen however, the cake didn’t puff as much and it didn’t form a hollow top crust. The top still crisped, but it remained solid, and I was able to plate the cake right-side-up. Somehow, the difference in ingredient brands and/or ovens caused these different (but equally delicious) results. Let me know which variety of cake you end up with- I am very curious! 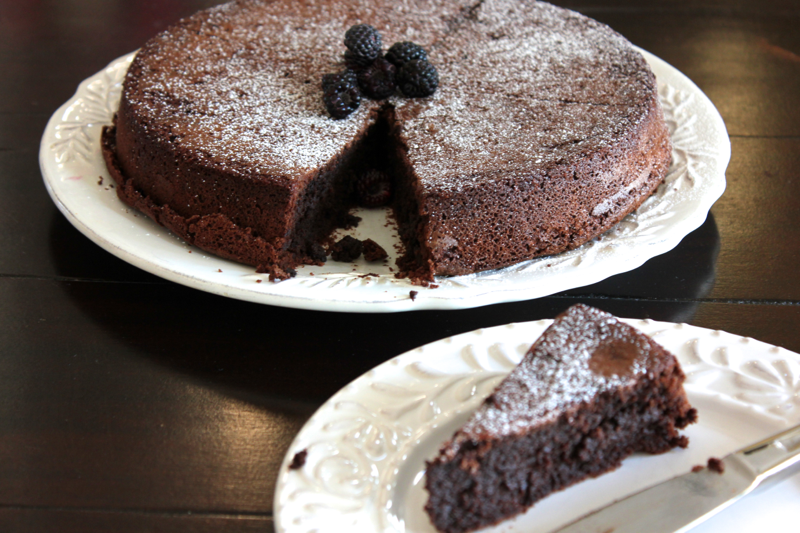 The cake is wonderful with a light dusting of powdered sugar, but I find it even more delicious to eat every bite with a berry. 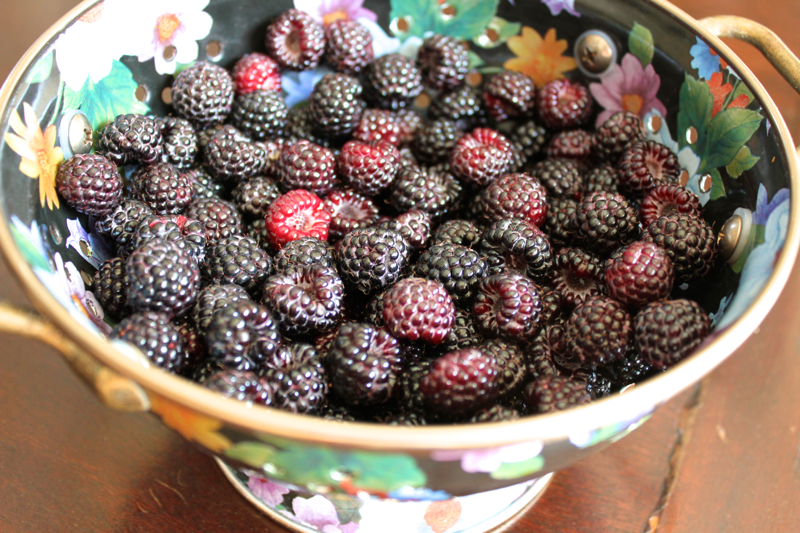 I picked these black raspberries from my parents’ backyard. Several years ago, I talked them into buying a raspberry bush, and for the last few summers, it has yielded only 2-3 raspberries, most of which the birds ate before we could. This summer, there has been a raspberry EXPLOSION, and the birds have let us take in the harvest. 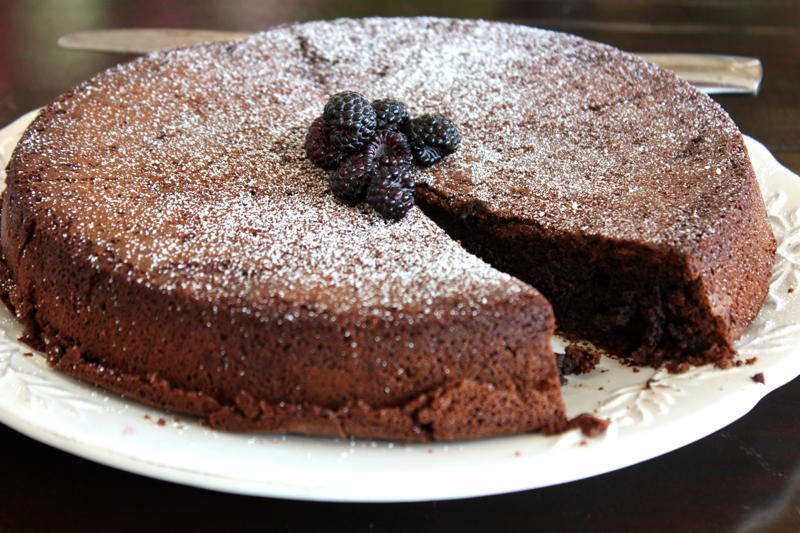 Serve the cake in thin slices with the powdered sugar and berries. My cousin enjoyed the cake with a glass of cold milk, which looked nice, if you like that kind of thing. Ice cream would also be fantastic. If you’re not feeding a crowd, fear not- this cake is just as delicious when eaten over a multi-day period. Just store it at room temperature, loosely covered with tinfoil. I will always associate this cake with feelings of comfort and home, and I hope you enjoy it as much as we did. That cake looks delicious. I may even try to make it. I know you cousin loooooved it!!! Hi! 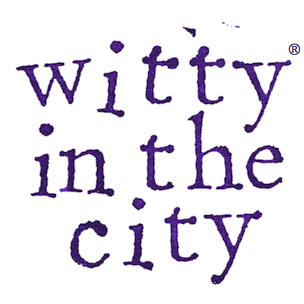 I’m probably your most distant follower – greetings from Finland! My son, 13, made this cake although it was a task to convert the quantitites to metric system, and it was super good! We had it together with wild blueberries and raspberries, and vanilla whipped cream, and it is a sure thing he will bake this many times! Absolutely delicious and relatively easy too. Thanks! Thanks so much for your comment! I’m happy this cake turned out well for you and your son, especially after those conversions. What a task! Your toppings sound delicious, and beautiful too.